Salon's Mike Madden twitters from the Tax Day protest across the street from the White House. The tea party in Lafayette Park in Washington, across from the White House, is under way, and Salon's Mike Madden is there covering the Tax Day protest. One of the the party's two permits was canceled at the last minute, which prevented the unloading of tea bags. But even without its namesake tea the event is still on with partiers reverently singing the national anthem. A woman in the crowd says: "We've seen this movie before," Obama is just like Mussolini -- "and look what happened to him." Protesters are chanting, "Don't tread on me! Don't tread on me!" 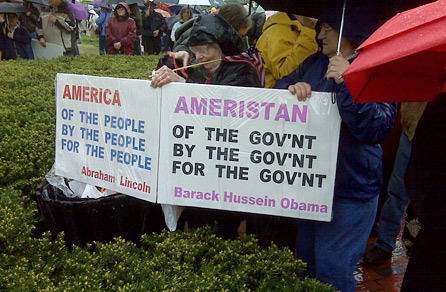 A sign in the crowd reads: "Of the gov'nt, for the gov'nt, by the gov'nt -- Ameristan -- Barack Hussein Obama." Another man in the crowd, who is wearing sunglasses despite the rain, gestures at the White House and says: "They're nothing but Marxist, socialist communists in there." Unprompted, another man in the crowd shouts, "Impeach the SOB! That's my slogan!" Even with a microphone in use, it's hard to hear anything from the stage, unless you're within 10 feet. A speaker inveighs: "Our economy used to be looked at as a model around the world and that is no longer, thanks to those folks across the street." Despite the pouring rain, the mud, the lack of tea and how hard it is to hear the speakers, the crowd is thrilled nonetheless; the tea party is Woodstock for Ayn Randers. Mike Madden is Salon's Washington correspondent. A complete listing of his articles is here. Follow him on Twitter here.